When was your Corvette "born"? You would think that a question as seemingly straightforward as "When is my Corvette’s Birthday?" would have a simple straightforward answer. It doesn’t. Happily, things become much clearer if you have many NCRS friends who have either lived the subject through decades of employment at Chevrolet or people who have literally studied the subject for decades by painstakingly researching and documenting individual cars. Studying the recently unearthed Corvette "Month Car Shipped Reports" has been invaluable, also. 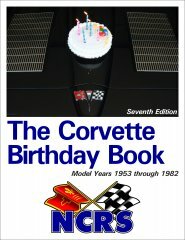 This NCRS Corvette Birthday Book is first and foremost based on the "Final Monthly Serial Number" data provided decades ago by Chevrolet. The hobby is lucky this data was saved, but there are gaps. Model years 1953, 1954, 1956, 1957, 1968, 1973, 1976, and 1982 all have either incomplete monthly data or some have numbers that simply do not "add up" correctly. Researchers in other automotive marques confirm our belief that there are inconsistencies in the Final Monthly Serial Number data. We used those Final Monthly Serial Numbers supplied by Chevrolet as a starting point for our research into Corvette "Birthdays". NCRS has been essentially doing research for nearly 40 years to document all facets of Corvette production. While individual members are finding "lost" Chevrolet records, researching specific cars, etc. ; the NCRS Team Leaders (also called NCRS Technical Advisors) are the organizers of our research. It is their teams of experts that have helped to fill in some of the missing Final Monthly Serial Numbers. In the span of 1953 through 1982 production, the data for 24 months have been lost. The missing data has been recreated through the study of Chevrolet Service Bulletins (referring to a specific Corvette being built on a specific date), archived Corvette Restorer magazine articles, Canadian Port of Entry dates, Trim Tag data, the recently recovered Corvette "Month Car Shipped Reports", and through generous NCRS members employed by Chevrolet in the relevant years. Determining when a specific Corvette was built is not as simple as "doing the math" to figure out how many cars were built in a day’s worth of production. To do it correctly, there are MANY considerations. The Flint, Michigan; St. Louis, Missouri; and Bowling Green, Kentucky Corvette Assembly Plants did not have a convenient set schedule of production over the car’s history. Labor strikes, parts shortages, new labor agreements, national holidays, new model "start-up", random assembly line "derating", changing model year starting and ending dates, etc. all played a part in determining when your Corvette was built! Introduction "When is my Corvette's birthday?"